This article first appeared on the CCAFS & CGIAR website on Feb 11, 2015. 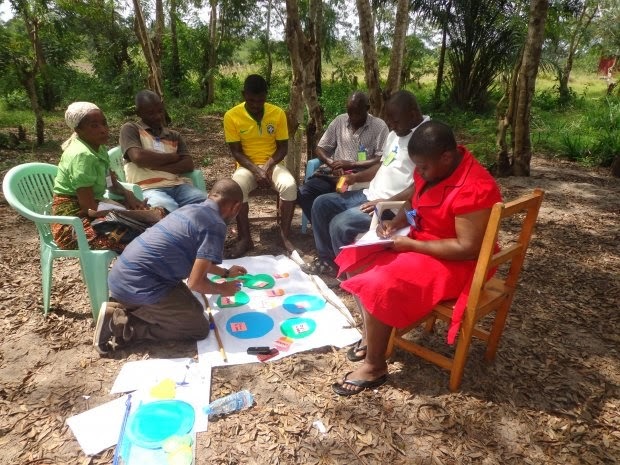 Using participatory methods, scientists are now working with farmers to understand climate impacts on farming systems and rural livelihoods and to identify locally appropriate climate-smart solutions. Temperature and rainfall in East Africa are increasingly variable but farmers’ ingenuity and enthusiasm among researchers keeps agriculture moving in the Southern Agricultural Growth Corridor of Tanzania (SAGCOT). Recently, a team of researchers from the International Center for Tropical Agriculture (CIAT) in collaboration with Sokoine University of Agriculture (SUA) carried out a Climate Smart Agriculture Rapid Appraisal (CSA-RA) in four districts in the SAGCOT. Under a project funded by the International Fund for Agricultural Development (IFAD) aiming to promote wide-scale adoption of locally appropriate CSA practices, CIAT is using the CSA-RA as a simple yet powerful tool to assess within and between district variations in farming systems, agricultural management practices, challenges for current agricultural practices, and climate vulnerability among farmers. The CSA-RA tool comprises farmer workshops with good gender and youth representation; expert interviews, farmer interviews and farm observations. It uses village resource maps; climate calendars, historical calendars, cropping calendars and institutional mapping as part of its participatory methods. The power of the CSA-RA is amazingly evident in the information gathered. In all the four districts, unreliability of the onset and cessation of the rains, uncertainty about the duration of the rainy season, occurrence of too much rainfall, and the long dry spells that fall within the cropping season were identified as major constraints. The associated identified impacts included: influx of pests and diseases associated with too much rainfall, water scarcity, famine, loss of livestock, and migration, especially for men who abandon their families. On average households experience 2-3 months of food deficit and in order to survive they engage in off-farm employment, small business and kiosks, sale of livestock, growing irrigated crops along valley bottoms, and remittances. So what are the perceived constraints to adoption of CSA by farmers in the SAGCOT? Several bottlenecks were reported and as one farmer said, due to the constraints “kilimo hakina tija” which loosely translates to “the many constraints are making farming less beneficial.” Commonly mentioned barriers include: access to markets, inappropriateness of the practices for the particular landscape; social preferences, for example, some local varieties have attributes preferred over improved varieties; lack of financial capital, for example, women lack capital to purchase fruit trees such as oranges; lack of technical knowledge/assistance, for example, farmers in Mbarali lacked knowledge on budding to adopt fruit tree seedling production; land tenure, farmers in Kilolo were reluctant to practice soil improvement on rented plots; labour, for example, in Mbarali row planting is considered to be more time consuming; and accessibility of inputs. With the numerous challenges, are there opportunities for scaling up CSA in the SAGCOT? Indeed, there is a high potential for developing and implementing locally appropriate CSA technologies across SAGCOT, including: use of information and communication technology such as short message service, workshops and seminars; mobilizing and leveraging local institutions and farmer groups; farmer-to-farmer extension; expansion through successful farmer-driven demo plots; focus on long-term resilience of farming systems that can cope with climate uncertainty and variability; and focus on soil health improvement. Overall, the CSA-RA highlighted the challenges facing farmers in four districts across the SAGCOT and identified key next steps for identifying and implementing locally appropriate CSA practices across the region. CIAT will use the CSA-RA to inform site selection for land health surveys and intra-household gender surveys planned in the SAGCOT. In addition, the information from the CSA-RA will be used to help prioritize CSA initiatives in the SAGCOT and Tanzania. The CSA-RA manual and reports are available here. Kelvin Mashisia Shikuku, Caroline Mwongera, Wendy Okolo, Leigh Winowiecki, Jennifer Twyman and Peter Laderach all work at CIAT on several interdisciplinary iniatives to out-scale CSA technologies in East Africa.